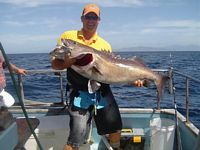 I have experience to be able to do any kind of trip we specialise in fishing but can be hired for any marine activity we have tackle included and hire equipment is available locally for diving. Cook Strait weather can sometimes be hard to predict I always try and get you out but if it looks dodgy at the last minute I may cancel even if you have travelled some distance we have to be safe. 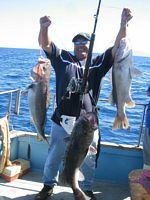 Join one of our organised trips for $150pp $200pp or $120pp to do this option just send an email to TheCaptain@WellingtonFishing.co.nz with subscribe in the subject box. 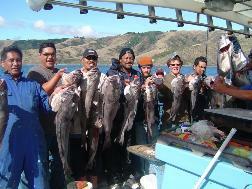 We are based in Titahi Bay, Porirua City just north of Wellington New Zealand. 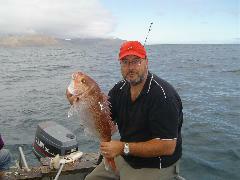 We can depart from Titahi Bay Wellington any time of the year. 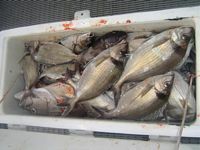 The trips are bottom fishing for tarakihi, blue cod and during the warmer months the addition of snapper, we specialise in snapper fishing, trevally gurnard kahawai albacore tuna groper and kingfish are a possibility from the Wellington west coast we can target kingfish if you want to do that. We get bookings from people from all walks of life, tradesmen, professionals out for a day team building, families, tourists. 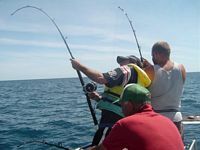 Snapper fishing off our 6 metre cat is popular for an evening trip, we also catch them in the summer and autumn whilst fishing for tarakihi. 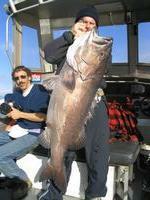 We have several options of fishing charters all with different prices to suit your budget. Either assemble your mates and make a group booking or call in as an individual, it is usually quicker if you have your group and are ready to book a date.